In general, parody is considered as a potentially demeaning and mocking imitation of another text. 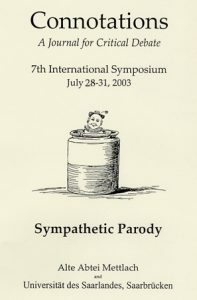 Conversely, “Sympathetic Parody” emphasizes the positive connection or inner affinity between the original and the parody. For example, a parody may contribute to making a literary work a classic, and the mockery can expose how seriously an author takes the topics, motifs or linguistic forms that he takes up parodically. The parodist himself may be the target of his own persiflage. Apart from this, there also is, for example, “Sacred Parody”: a secular text is turned into a sacral one; flippancy is turned into earnestness. This thematic framework can account for a wide variety of article topics: from Shakespeare’s parodistical imagination of Falstaff to the double structure of mockery and sympathy in Gulliver’s Travels, to David Mamet’s self parody, and parody as a form of cultural memory in Science Fiction.